After: The extended hearth creates an inviting place to hang out with friends. A cozy lounge reminiscent of a martini bar was Pasadena homeowner Carolyn Powers’s wish. To achieve her dream of a glamorous hideaway, Powers turned to designer Jennifer Charleston, who began by extending the fireplace 6 feet along the wall and adding a mantel and storage cubby for firewood. Charleston also divided the room with a sheer curtain, hung from a recessed track, that tucks into a slit in the wall when not in use. The fireplace now works as the unifying factor for the multifunctional space. Info: Design, Jennifer Charleston, , Los Angeles (213/622-7830). Here are designer Jennifer Charleston’s essential ingredients for creating this look. Simplicity: The earthy palette warms the room. 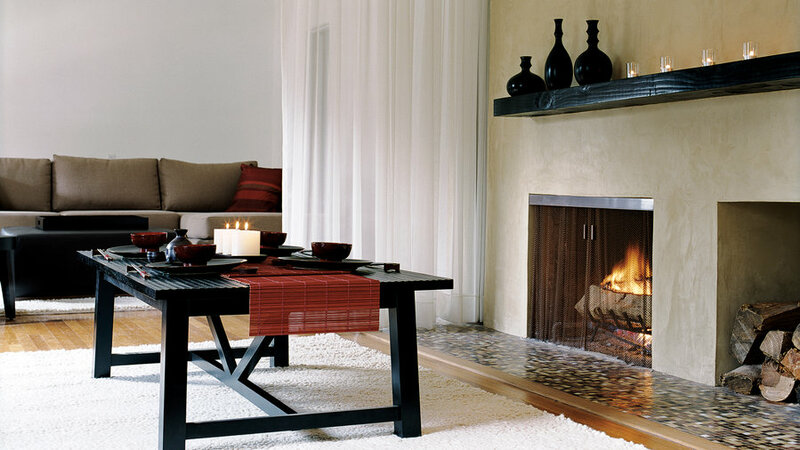 A custom fireplace screen of copper mesh ( ) allows the fire to take center stage. The grain of the fir plank mantel is still visible under a dark espresso stain. Accents used sparingly make for an uncluttered feel. Varied textures: The plaster on the fireplace wall (similar Antiqua finishes from , 714/637-7341) was left unpolished for a warm, suedelike finish. Glass mosaic tiles ( ) in brown, bronze, burgundy, and white gleam in the firelight. The curtain adds softness and variable degrees of privacy and connection. Functionality: The reconfigured space serves multiple purposes: party zone and retreat space. The low table can hold coffee cups or dinner; the mantel doubles as a ledge for cocktails.